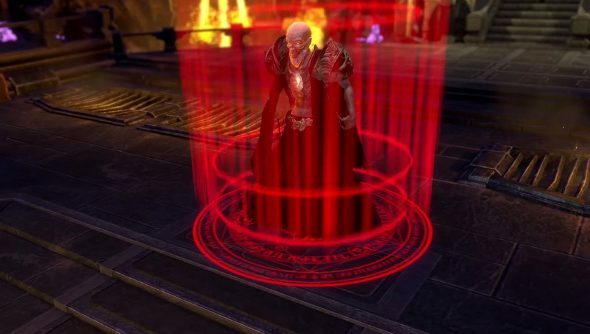 Last week saw Sword Coast Legends developers n-Space show off the single-player aspect of their D&D-themed isometric RPG and just about the worst attempt of a Scottish accent any Dwarf has ever made. This week, the video is all about the novel Dungeon Master multiplayer mode, where adventurers face off against a human adversary, and more awful accents. The DM sets theme of the dungeon — one that the other player is heading to as part of the single-player campaign they’ve embarked upon — changing the tileset and what enemies can be found lurking within. But that’s the only time that the DM can do anything while the other player waits, because the moment the dungeon starts, the DM has to react in real-time. DMs use a resource called threat to fiddle with the dungeon, from adding locked doors and traps to summoning enemies. Threat can even be spent on changing encounters, so that instead of facing a group of enemies standing in the middle of a bridge, they’ll be facing an ambush. It’s an interesting twist on the DM role, making them more adversarial and, unusually, more of a player. There are resources to manage, and a DM can even get loot, which in the case of the video was the ability to summon some zombies. Though there are challenges from the DM, as they’ll need to think quickly as they attempt to throw obstacles in the way of the player, it also looks like threat generates quickly enough so that there are plenty of ways to send the adventurers to an early grave. n-Space clearly see the DM as a role that keeps dungeons interesting, rather than an opponent whose single goal is the death of the party. That’s why, as well as summoning and levelling up monsters, the DM can also remove them or make them weaker for the sake of balance. I wonder if the competitive spirit of some players will get the better of them, though. As asymmetrical multiplayer goes, though, it’s one of the most intriguing examples.